There’s nothing quite like the mouthwatering smell of freshly-baked bread to make your home feel welcoming! That’s why so many people are taking up the hobby of baking their own bread. And it’s now easy for even an average home cook to produce delicious, bakery quality loaves by using a bread machine. If you have a large family, you can also save yourself a lot of “dough” by making your own bread too! We’ve put together this helpful buyer’s guide to bread machines to give you the low-down on everything they have to offer. You’ll be amazed just how versatile modern bread machines are! Did you know that you can make jam, cakes, and even pasta in a bread machine? 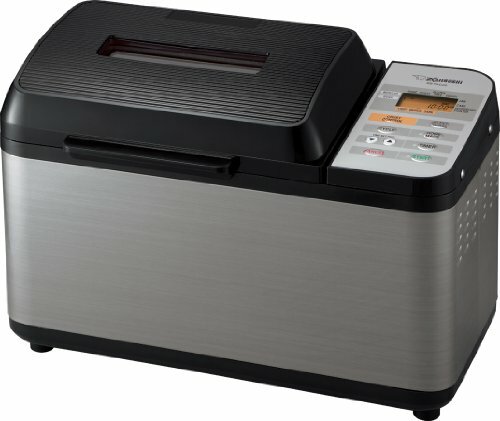 There are lots of bread machines to choose from, so we’ve taken away the legwork and put together our Top 10 bread machines that are currently available to buy via Amazon.com. The handy one-click links enable you to easily navigate to each product’s features and read bread maker reviews from other purchasers. And we’ve answered the most commonly asked questions about bread makers too in our Q&A section at the end of this article. Armed with all the information you need, you can then make your purchase and look forward to creating your own, delicious home-baked bread! So, what considerations do you need to bear in mind when choosing the best bread maker for your needs? Let’s look into the features you’ll want to evaluate before picking out your perfect countertop baking partner. Most people like to have their bread maker out on their countertop for convenience. It’s therefore important to check the dimensions of the bread maker to make sure that it will fit into the space you have allocated for it. If you are planning on keeping the bread maker in a cupboard, you may want to opt for a lighter model. The features offered can greatly influence the price of a bread maker. So, what features do you need and which can you do without? All bread makers have a non-stick pan with a kneading paddle. In many bread makers, the kneading paddle remains in place while the bread cooks. Consequently, your bread will have a small hole in the top. With poor quality bread makers, the dough tends to stick to the paddle, tearing the bread and leaving a large, ragged hole. 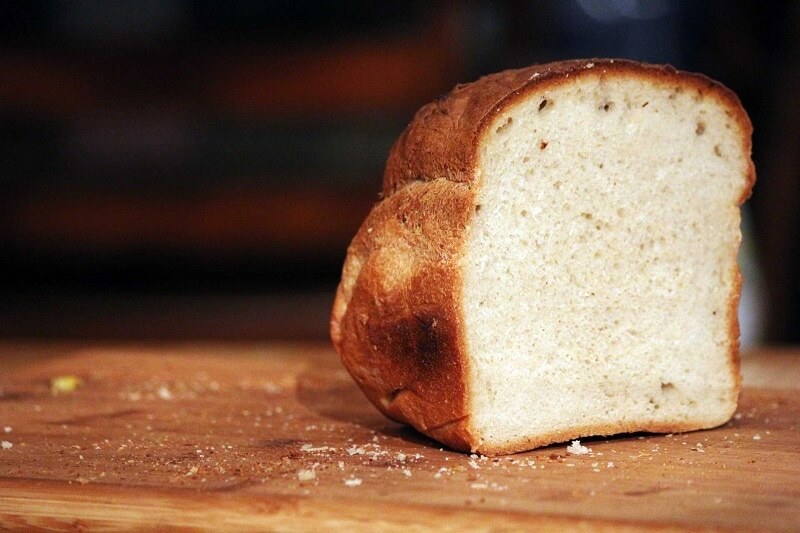 If you prefer not to have holey bread, look for a bread maker that has a collapsible paddle or one that can be removed before baking begins and the kneading process is complete. If you want to keep an eye on your bread as it bakes, choose a bread maker that has a viewing window. This will prevent you from lifting the lid of the bread maker to check the loaf and allowing all the heat to escape, which could affect the end result. Some bread makers feature an alarm system that notifies you when the bread is ready or when it’s time to add more ingredients to the dough as it bakes. This is useful if you plan to create loaves with more complicated recipes. Some bread machines have an automatic yeast dispenser, which saves you having to be around to add yeast to the dough at the right time. If you enjoy fruit bread, you might want to look for a bread machine that has an automatic fruit and nut dispenser so that you can simply load the machine with the ingredients required for your recipe and leave it to do its work, while you get on with your day. Each bread maker has a control panel, allowing you to set the timings for different recipes. Look for a control panel that is clear to read and easy to program, especially if you’re a baking newbie. If you’re struggling to get the machine to work properly, you’ll quickly become frustrated and discouraged and the bread machine will probably end up at the back of a cupboard, unused. 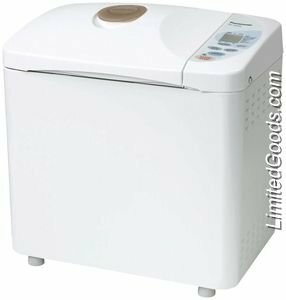 Similar to rice cookers, most bread makers will state the time it will take to bake various types of loaves, and these can vary from machine to machine. Some also have a rapid-bake feature. If you’re usually short of time, it’s worth looking for a model with a rapid-bake setting. These machines can usually produce a standard white loaf within one hour – perfect if you’re always on the go and you haven’t time to wait for your bread to bake. All bread makers can bake basic white, wholemeal, and brown loaves. However, there can be some variation in the success of each type of loaf. Check the reviews left by other buyers to see how the machine you’re thinking of buying copes with different types of flour and additional ingredients. Sometimes, the guidelines given for a darker crust, firmer texture etc are geared towards white bread only, so read the manufacturer’s guide carefully to check for this, especially if you’re intending to use the bread maker for brown loaves only. Some bread makers have a delay time setting. This feature means that you can set the bread maker to bake overnight, so that you wake up to fresh bread in the morning. Although this is a very useful feature, you should bear in mind that some bread makers are quite noisy during the mixing and kneading process, which could be a problem for you if your kitchen is near to your bedroom. If you’re intending to make rye or other varieties of bread that need ingredients adding to the mix at intervals during the baking process, you’ll need a bread maker that has an auto-dispenser. An auto-dispenser will add extra ingredients such as nuts or dried fruit, without you having to do so manually. Many modern bread makers now come with a gluten-free setting. 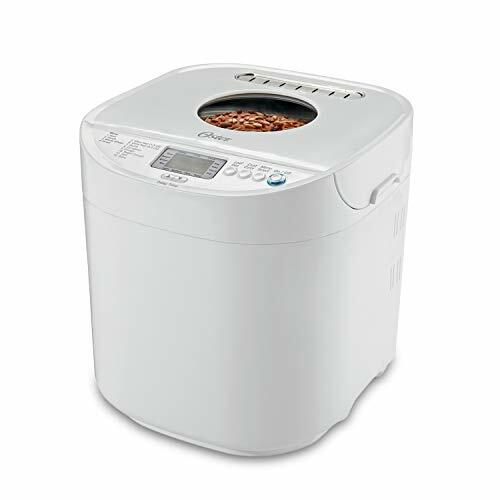 If you have particular dietary requirements, look out for a bread maker that has a gluten-free setting that will allow you to use special gluten-free bread mixes and recipes. We’ve included some gluten-free bread machines and gluten-free bread machine reviews later in this guide. Here are a few important things to note when using your new bread maker. 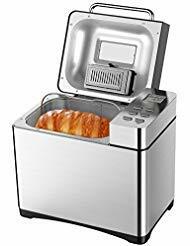 • Although all bread makers have insulated outer walls, they do still get warm during operation, especially those with a stainless steel shell. Always use oven gloves when removing the bread pan after baking and take care around the machine, as it could be hot. Make sure that the bread pan has an easy-to-access handle so that you can remove the pan from the machine when the bread has baked, without risking burning your hands. • When cleaning the pan, always remove the kneading paddle too. This ensures that no bits of bread are left stuck beneath the paddle, which could spoil future bakes. • Most bread maker pans are NOT dishwasher-safe; putting the pan through a dishwasher can damage the non-stick surface. Always wash the pan and paddle by hand, using a soft cloth and warm, soapy water. To loosen any hard-to-shift residue, place the pan and paddle into a bowl of warm, soapy water, and allow them to soak for 10 minutes. • Always use plastic or wooden utensils for removing ingredients out of your bread maker. Metal utensils will scratch or damage the non-stick surface of the bread pan. Now you know what to look out for, let’s move on to look at our top 10 favorite bread makers. 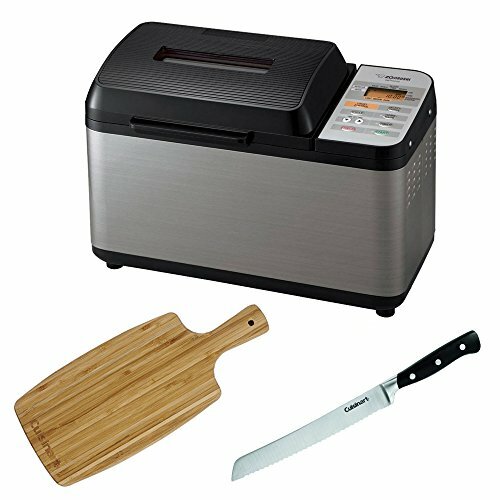 Oster have a good reputation for producing cooking equipment of superior performance, durability, and versatility, and this smart, white bread machine is no exception. The bread machine is designed to make loaves up to two pounds in weight – ideal for a family. The machine comes complete with a range of tested recipes too, so you can be sure of a good result every time. Multiple settings offer versatility, and there’s a delay-bake timer that allows you to set the machine for up to 13 hours in advance. If you’re in a hurry, use the ExpressBake option to make a delicious loaf in under one hour. Once the loaf is done, you can set the machine to keep the bread warm until you’re ready to eat it. The bread machine has a large LCD display that’s clear and easy to use. The viewing window in the top of the machine allows you to keep an eye on the progress of your loaf, without having to open the lid. A kneading paddle, measuring cup, and measuring spoon are all included. In all, the machine has 12 different bread settings to choose from, so you can create loaves just the way you like them. Also, you can make pizza dough, jellies, and jams via simple automatic settings. 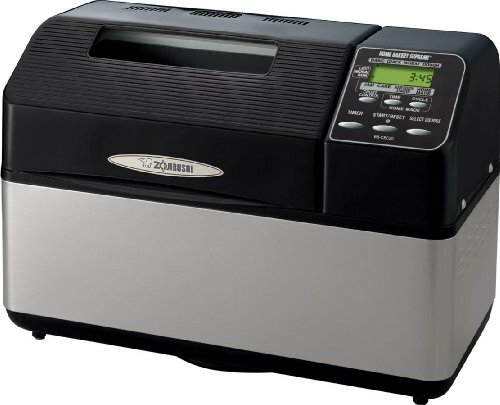 This superior quality bread machine makes a two pound, family sized loaf of bread. It’s a versatile piece of kit, allowing you to make all kinds of bread from basics to garlic bread sticks, meatloaf, cakes, jam, and more. There are 10 programmed settings to choose from and three different crust shades; light, medium, and dark. The machine has a 13 hour delay timer feature, so you can set the machine to have your fresh-baked bread ready for when you get up in the morning or for when you arrive home from work at the end of the day. The large LED function panel is clear and easy to use. Two kneading paddles ensure thorough dough kneading to give every loaf you bake a higher rise and lighter texture. There’s a viewing window so you can keep an eye on your bread as it bakes. The bread machine comes with a double-ended measuring spoon, a measuring cup, and a user manual and DVD containing a variety of recipes that have been tested in the machine. The non-stick coated baking pan is dishwasher safe, but is very easy and quick to clean manually too. The bread machine has a built-in shut-off system for safety and a 10 minute back-up in the event of power failure. Panasonic are one of the world’s top manufacturers of electrical equipment, including kitchen accessories. Their 550 watt bread machine bakes loaves in three sizes up to 2.5 pounds – perfect for a busy family home. Panasonic’s products are extremely reliable, but they include a limited one year warranty with this product, even though you probably won’t need it. The soft-touch push-button control panel has an easy-to-read LCD display. This bread machine offers you the ultimate in convenience and choice. You can set the machine to make loves of white, wholemeal, French, multigrain bread, with a choice of three crust settings. Yeast is added via an automatic dispenser located on the unit’s lid. You can also use the bread machine to bake cakes, make pizza dough, and jams. The instruction manual contains simple-to-follow recipes for 40 different breads and other doughs, so you’ll never run out of inspiration! If you want to enjoy freshly-baked bread for a companion to your eggs for breakfast, simply set the 13 hour delay timer. There’s a rapid-bake setting to reduce the baking time of basic breads. A further option allows you to set an audible alarm, reminding you to add dry ingredients such as fruit and nuts to your dough. The bread pan has a useful handle, allowing you to lift the finished loaf out of the bread machine without danger of burning yourself. 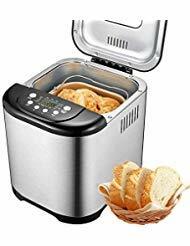 This gluten-free bread machine by Aicok offers a huge choice of 19 different programs, allowing you to make lots of different breads (including gluten-free), cakes, jams, and even yoghurt! There’s a viewing window so that you can keep track of your bread’s progress. The clear and simple to use LCD display on the control panel displays a countdown of the baking time remaining. A handy fruit and nut dispenser releases extra ingredients into your bread at the optimum time. You can bake loaves of 1.1, 1.7, and 2.2 pounds in the machine, depending on your requirements, and you can select your preferred bread crust by using the settings for light, medium, or dark. Useful additional features include a 15 hour timer with memory so that you can set the bread machine to start during the night – imagine waking up to the smell of freshly-baked bread for breakfast! You can also use the timing function to keep your bread warm for up to one hour. In case of a power outage, the bread machine has a 15 minute power recovery feature to ensure that your bread won’t be ruined. The bread machine comes complete with a dough hook, measuring cup, and measuring spoon. This is a good-quality product, but it also comes with a two year replacement warranty. 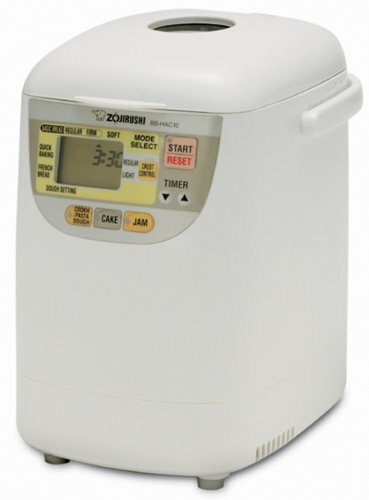 This top-quality bread machine from Zojirushi is designed to produce lots of different types of bread, including gluten-free. The bread machine makes a two pound loaf in a large, traditional rectangular shape. You can also make many other varieties of bread in the machine, including gluten-free and organic recipes. The bread machine has a 12 hour clock with a 13 hour bake-delay feature so that you can program the machine to deliver your fresh bread just when you want it. You can also set the machine to rapid-bake, assuring you of a perfect basic loaf in just two hours. Choose from light, medium, or dark crust. The machine has dual kneading paddles to ensure that the dough is thoroughly kneaded before baking for perfect rise and delicious fluffy bread. A good, even bake is assured thanks to the dual heaters on the top and underside of the bread machine. Keep a close eye on the progress of your bake through the large viewing window. The large, easy-to-read LCD display and convenient key code located on the lid of the machine makes choosing the desired program quick and simple. The bread machine comes with a liquid measuring cup, a set of nested measuring cups, and a measuring spoon. In addition to bread, you can make doughs, cakes, and jams. The Hamilton Beach bread machine has 12 programs, including one for gluten-free. You can also use the bread machine to make jam, dough, and cake. There’s a handy audio reminder facility for adding nuts and dried fruit. You can make 1.5 or two pound loaves in the bread machine, and you can choose from light, medium, or dark crust settings, whichever is your preference. Not only that, you can also make pizza dough, flatbread and croissant dough, cakes, and jam. If you want to add fruit, nuts, and other extra ingredients to your bread, the audible reminder feature tells you when to do so. The large, easy-to-read digital display has a delay timer, so that you can add ingredients when you want to or delay the baking process to begin later – ideal for breakfasts and entertaining. The bread machine pan and kneading paddles are dishwasher-safe, although they’re also non-stick so cleaning is a breeze. The dual kneading paddle design allows you to make bread using just one paddle, while the other is in the dishwasher. This stylish looking bread machine will look great on your counter top and has non-slip feet to keep it in place. The body of the machine is designed to stay cool when in operation so you won’t burn your hands. The machine has a detailed and easy-to-follow instruction booklet, which contains a wide range of gluten-free and whole-grain recipes. With 19 different programs to choose from, you’ll never be stuck for inspiration if you buy this bread machine! The machine has a gluten-free setting, and you can also make yoghurt, jam, cake, and dough. There’s a handy viewing window so you can keep an eye on the progress of your loaf, and an LCD display on the control panel counts down the time remaining for each bake. The machine has a fruit and nut dispenser, allowing you to set and forget, so you won’t need to be around to add extra ingredients to your loaf. This bread machine makes loaves from 1.1, 1.7, and 2 pounds, and you can choose from light, medium, and dark crust, depending on your own personal taste. You can set the machine to prepare your bread up to 15 hours in advance, and it will keep your loaf warm for up to 60 minutes so that it doesn’t go soggy. If there’s a power outage, the machine has a 15 minute recovery facility so that your bread won’t be ruined. Included with your purchase re a dough hook, a measuring spoon, and a measuring cup. The bread machine comes with a two year warranty. 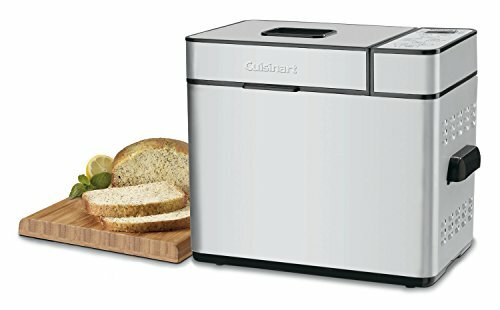 This gluten-free bread machine from Cuisinart is a quality product, as you would expect from this maker, which offers you 12 pre-programmed menu options. You can make 1, 1.5, and 2 pound loaves and choose from three crust settings – light, medium, or dark. All you need to do is add the ingredients to the bread machine, select the program you want, using the simple-to-use LCD display, and the machine takes care of the rest. There’s also a 13 hour delayed start timer, allowing you to set the machine to bake your breakfast loaf while you sleep. The large viewing window lets you watch your bread baking, without having to open the lid and ruin the rise. Sturdy stay-cool handles protect your hands from being burned when you remove the finished loaf in its pan from the machine. There’s a power-failure back-up to save your loaf in the event that there’s a power cut while the machine is operating. The kneading paddle and bread pan are both removable for easy cleaning. A measuring cup, measuring spoon, and a recipe book with foolproof recipes for gluten-free breads, sauces, and jams are all included with the bread machine. If you want to avoid a hole in your loaf when it’s complete and ready to be cut, simply remove the kneading paddle when the audible alarm sounds before the last rise cycle. When the bread is baked, the machine will keep it warm for up to an hour so that it doesn’t go soggy. 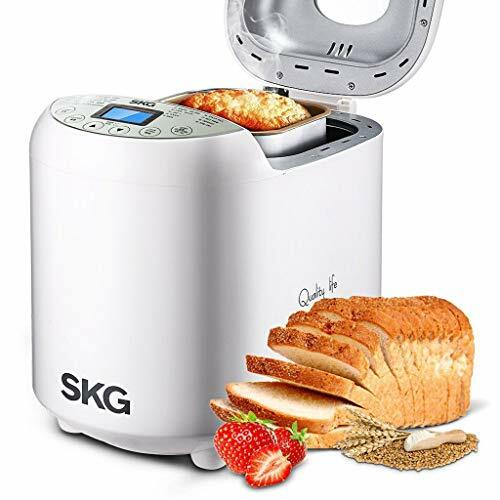 The SKG gluten-free bread machine is aimed firmly at those who are new to making their own bread. You can make a 1, 1.5, and 2 pound loaf in this machine, which also has a choice of 19 programs and three crust choices – light, medium, and dark. In addition to gluten-free bread, you can make basic bread, jam, and even yoghurt in this machine. The 15 hour timer allows you to set the machine before retiring to bed or going to work so that you have a nice, warm loaf waiting for you when you want it. You can check the progress of your loaf by peeking in through the large viewing window on the top of the machine. The non-stick coated pan and handle make for easy cleaning, and non-slip feet keep the machine from slipping around on your countertop. Although this is a reliable and sturdy product, customers are offered a one month free trial and a two year warranty on all parts and accessories. This versatile mini bread machine is compact and slim in design so it takes up minimal space in your kitchen. An instruction booklet and DVD with easy-to-follow recipes is included. The machine makes a one pound loaf, and can also be used to make cakes, jams, and cookie and pasta dough. There’s a 13 hour delay-bake feature so that you can set it to bake your bread ready for when you get up in the morning or arrive home from work. The machine has a quick-bake cycle that prepares basic bread in under two hours. Choose from three different bread textures; regular, firm, or soft, depending on your preference. The baking pan and kneading blade are non-stick, and the lid is removable so cleaning the machine is a quick and hassle-free just like most other cookware sets with non stick pans. Q: How much should I pay for a bread machine? A: If you’re new to bread making and just want to try it out, it’s probably not worth spending a fortune on an all-singing, all-dancing bread machine. You can still get a good quality one without having to break the bank, although it will be a more basic model. For those who are serious about baking their own bread, you’ll want to stretch your budget to buy the best model you can afford with a wide array of different features. Use our bread maker reviews to find the best model in your price range. Q: What’s the difference between bread type cycles? A: Bread machines are programmed with difference baking cycles for different types of bread. Each cycle has a specific temperature and time that’s designed to maximize the performance of the dough. For example, a “whole wheat” cycle gives a longer rise and take time. Read the manufacturer’s guide carefully to make sure that you choose the correct cycle type for your bake. Q: Which crust color do I choose? A: Your bread machine can be set to produce different crust colors. If you want a soft, light crust, select a light cycle. If you prefer a dark, crispy crust, go for a darker cycle. Bear in mind that if your recipe contains lots of sweeteners or grains, it will brown more quickly, so choose a light crust cycle. Q: Can I use yeast in my bread machine? A: You can use yeast in any bread machine. When using active dry yeast, use ¾ teaspoon of yeast per cup of flour. Active dry yeast is not recommended for use on rapid-bake settings of less than one hour. If you’re using instant yeast, use ½ teaspoon per cup of flour. In rapid bake machine cycles, double or triple the yeast amount, according to the manufacturer’s guidelines. When baking with yeast, always use liquids at a temperature of 800F and all other ingredients at room temperature.